Stocks are continuing their record run and for today at least, you can thank the Fed for that. The central bank said Wednesday that interest rates aren't expected to rise until 2015. Investors love that message. 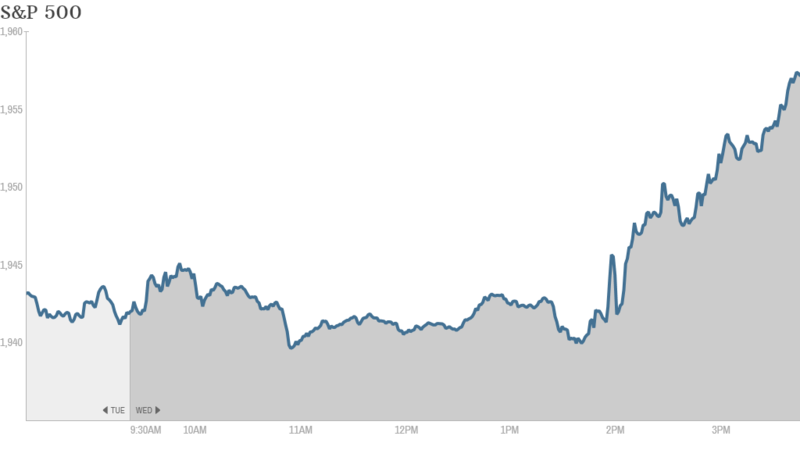 The S&P 500 closed at a record high of 1,957 while the Dow jumped almost 100 points (0.58%). The Nasdaq also bounced to finish at its highest level in 14 years. Stocks were down most of the day prior to the Fed news. "$SPY $DJIA $QQQ Is it just me or is Janet just answering exactly what they want to hear," said StockTwits trader IPOChaser. 1. Fed taper and dot plot: As expect, the Fed said Wednesday that it will cut its monthly bond purchases by another $10 billion per month and keep its key federal funds rate near zero. The key question for investors is whether the Federal Reserve is likely to raise interest rates by the end of the year or wait until 2015. To that end, the Fed soothed worries when it released its "dot plot," the Fed's version of a straw poll of its board members views on interest rates. The latest dot plot showed all Fed members except one (there's always one) believe interest rates will remain the same through the end of 2014. In a press conference this afternoon, Fed Chair Janet Yellen maintained that interests rates would remain low even after the Fed completely winds down its stimulus, but she didn't nail down any more details, saying "there's no mechanical formula" for rate increases. 2. Another strong day for tech -- Amazon, BlackBerry, Adobe: Amazon (AMZN) CEO Jeff Bezos unveiled the Fire Phone, the tech giant's first smartphone, which includes a 3-D component, at an event near the company's Seattle headquarters Wednesday. The stock got 2.7% boost. Also related to Amazon, BlackBerry (BBRY) shares popped over 3% after the struggling smartphone maker announced that the Amazon Appstore will be available on its new operating system that's launching in the fall. The move significantly expands the number of apps available to Blackberry users. But one StockTwits trader was skeptical. "$BBRY BB apps on Amazon, what a joke! as though that will help BB's business," said Day_Trader_1. BlackBerry is in the midst of trying to execute a turnaround, and lately, investors have been pleased. The stock is up 14% in the past month, though it is still down nearly 45% for the past year. 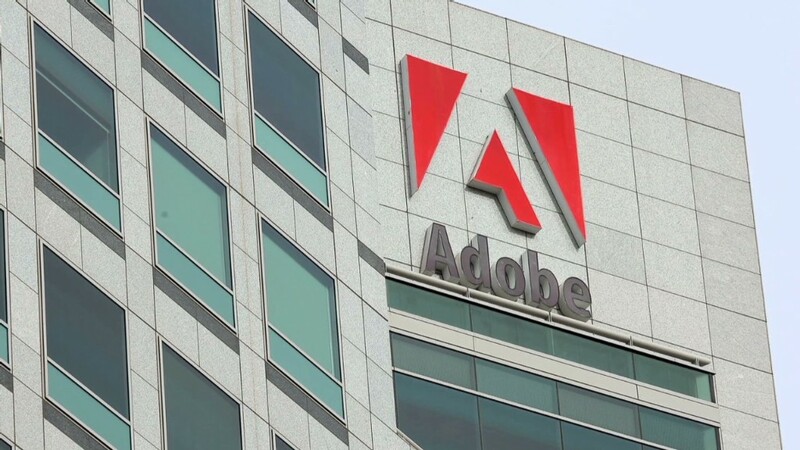 Adobe (ADBE) spiked over 8% after reporting better-than-expected quarterly results Tuesday evening. The company, which is behind the popular Photoshop software, said revenue in the period was driven by the acceleration of its cloud business. "$ADBE Makes me smile brighter than the sun, cloud computing rules it today," said indoor47 on Stocktwits. 3. Other movers and shakers -- FedEx, ConAgra: FedEx (FDX) has finally stopped blaming the weather. The company released strong earnings Wednesday and shares got a nice lift of over 6%. Last quarter, FedEx claimed that its operating income would have been $125 million higher if not for the unusually harsh winter weather earlier this year. ConAgra Foods (CAG) shares took a nose dive of 7% after the company cut its profit outlook for the three months ending in May, citing challenges from some of its retail brands, including Chef Boyardee. 4. Iraq still violent, but markets less nervous: Tom Elliot, international strategist at the deVere Group financial consultancy, said markets were remarkably "placid" in the face of violent upheaval in Iraq. He said that investors "no longer have to jump up and down with worry and fear every time an oil field in the Middle East changes hands" because the U.S. is less dependent on foreign oil thanks to the energy boom. To that end oil markets have leveled off since jumping initially in the face of Iraq tensions. Crude oil is still trading at $106 a barrel. Gold, often seen as a safe haven in times of turmoil, is off its highs from the end of last week as well when the crisis first grabbed headlines. 5. International markets: European stock markets finished mixed. Russia's main index rose almost 1.5% after Russian President Vladimir Putin and Ukrainian President Petro Poroshenko discussed the possibility of a ceasefire in eastern Ukraine. The ruble made similar gains versus the U.S. dollar. Asian markets ended with mixed results. The Nikkei in Japan rose by nearly 1%, but markets in India and China were in negative territory. Investors will continue to watch Argentinian markets, since many fear the country could be close to defaulting on its debt. The Argentine stock market has rebounded strongly the past two days.